Hotel ibis Hamburg Alster Centrum. Book online now! Wifi! Those traveling by bus or train will appreciate the location of the ibis Hamburg Alster Centrum, which is located right by Hamburg main train station and the bus station. It also enjoys great transport links with the U-Bahn (underground) and S-Bahn (cityrail). Our hotel has 165 air-conditioned rooms and WIFI. The reception is open 24/7 and drinks are available around the clock. We have a meeting area for events. Park your car in the hotel's indoor car park with CCTV. For your own personal wellbeing, all 165 rooms have individually adjustable air conditioning. Soundproofing and innovative beds will ensure you enjoy a relaxing, restful night's sleep. With free WIFI and TV with a wide range of Sky channels. Room had everything needed, comfortable good bed, bathroom enough space to put towels and cosmetics, especially bathroom I found very well designed. Would stay in this hotel again. Hotel staff helpful. nice hotel. Great location. Very friendly staff. The hotel was really very nice Good modern design. I really recommend this hotel. Terrible smell in the room. Noisy. Good variety for breakfast. Comfortable room though not that much space for clothes etc. The welcome at the reception was extremely awkward. We arrived around 5pm Both of the girls at the Check-in counter had a passive-aggressive attitude that was unbearable. We received a room on the lowest floor facing the back with a train line. After a few minutes in the room we decided that with my wife being pregnant and having a light sleep this wouldn’t work. So she went down to request a quieter room. The two ladies were not only very condescending about the room change. They also made us bring all our luggage downstairs again before we got the key. This was not only humiliating but also very tiring because my wife is pregnant an cannot carry heavy stuff. It was a try outside of the booking.com world but it didn’t play out well for us. This e perimeter at the reception really made me reconsider my brand choice. We will probably not choose ibis again because of that. 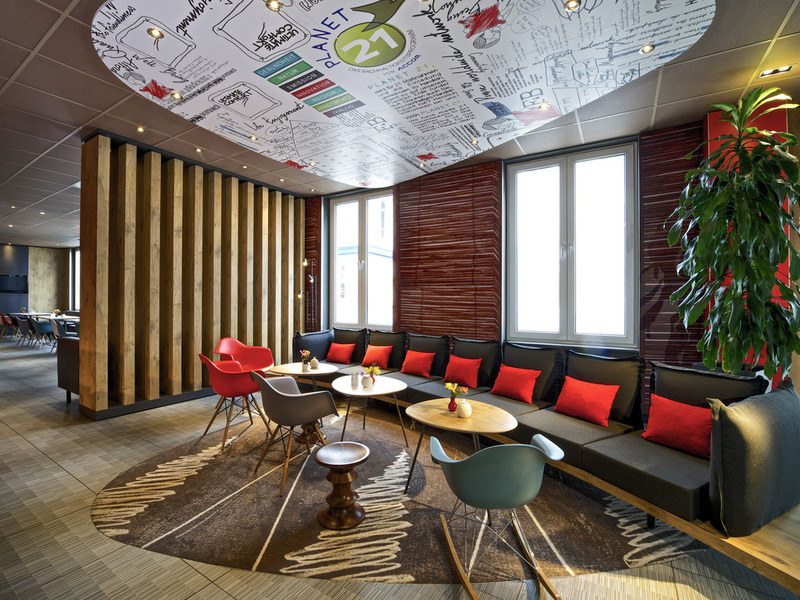 It seems like it is too difficult on Germany to find at least semi-friendly staff that is qualified enough..
Dear Guest, Thank you for taking the time to tell us about your experience at the ibis Hamburg Alster Centrum. I am sorry that your experience did not meet your expectations; please allow me to express my sincerest apologies. At Ibis, we strive to provide a superior service experience for every customer; therefore your feedback is very important to us. Please rest assured that we are taking the appropriate measures and talk to the both girls at the reception. We appreciate your sharing your concerns, and it is our hope that you will give us the opportunity to better serve you in the near future. Sincerely, Oleg Gomberg. location /excelent, staff/ frendly, HTL very clean. The staff is very very nice! The hotel is modern and clean. We had a room facing the railroad and due to the afternoon sun warming up the room, we had to have the windows open all night to be able to sleep from the heat. But with the windows open, the loud noise from the railroad kept us awake instead. Overall the stay was nice, the hotels location is amazing and the staff was very nice to us and our little dog. same standard as ibis ! comfortable with sufficient facilities in good location! everything was as expected but after a long trip and arriving at the hotel in the morning, an early check in (at around 9 am) was extraordinary for us ! Air-condition system did not work in our room (it was cold), but when we informed reception about the problem, he gave us an electric heating with no hesitation and then everything was fine in the room! I was very upset about the choice of coffee machine you have made for your bar. I ordered a cappuccino and paid EUR 2.90 for it. It was not a cappuccino at all. It was a sour coffee (bad beans) combined with a very thin layer of something that was not even foam. The taste was disgusting and I told the lady that it was not drinkable. Instead of giving me my money back, she insisted on giving another cup as if that would make a difference with a bad machine! I am really upset about this poor choice by IBIS management just to improve your bottom line. That is greed - to serve cheap, bad coffee and still take the high price for it. We used to be able to rely on decent quality by Ibis although not 5-star, of course. The Panini sandwich was the same. Just a pile of warm pressed stuff. No crisp, nice sandwich. What do you really think that you are improving. Do you think you can keep customers this way? It will never cease to amaze me how some bureaucrat bean counters behind a desk think they can &quot;improve&quot; a hotel's or chain's bottom line by making such poor choices. They should all be punished by being forced to drink a cup of this &quot;cappuccino&quot; once an hour for the rest of their lives! I am definitely glad that I had not booked breakfast at this hotel which my husband and I normally do when we stay at Ibis. The room was nice, but it was very loud, when doors where slamming or someone was on the same floor walking or talking. I even closed the additional door between room-door and the real room, where the bed was located, but this did not help. Therefore I was not able to sleep very well. The room itself was nice, it was clean and big enough for staying there. The bed was nice, too. The options for breakfast were very great. If there hadn't been the problem with the noises, I would rated my experience with 9/10.